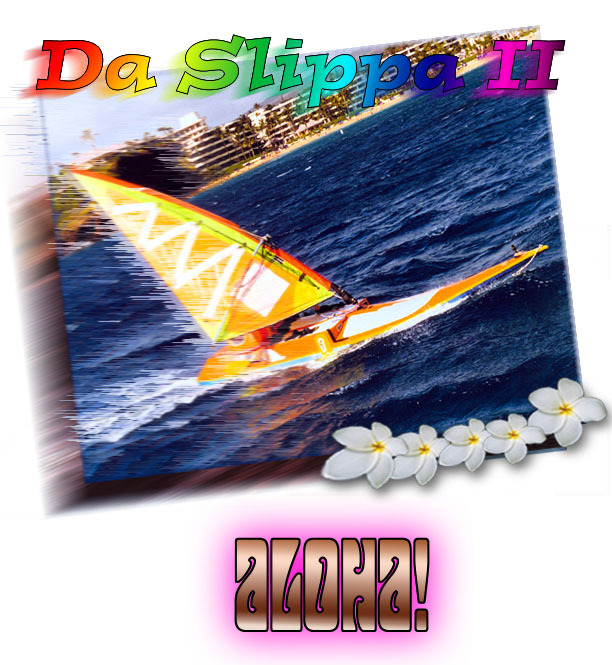 Welcome to Steve Fisher's homepage for the trans-Pacific trips and voyages of "Da Slippa II", otherwise called "Da Slipper II" for people,who are not familiar with Hawaiian slang. This is one of the world's only windsurfers capable of and having completed several oceanic crossings. In order to best view this site you should be using either Netscape 4.x or Internet Explorer 4.x. Please click on either icon to download a FREE version of either browser. Simply install the browser after downloading and come on back to enjoy some of the newest features on the web. You should automatically be transferred to the website in about 40 seconds. If not for some reason, then please click here. Mahalo Nui Loa (thank you) for visiting!